Chandigarh, 29th December 2016: Bank of Baroda, India’s leading public sector bank has entered into MOU with Heritage Foods Ltd. (HFL) with an objective to provide dairy loans to the farmers through the network of Bank of Baroda branches across the country. Heritage Foods Limited, a public limited company, engaged in the business of procurement, processing and sale of milk and milk products. Narration of the Photograph: Shri G B Bhuyan (Centre), Head – Rural Banking (Agriculture& FI) and CSR, Bank of Baroda seen exchanging the agreement with Mr.Ch Satyanarayan (Right), Zonal Head, M/s Heritage Foods Ltd.
Mr. G.B.Bhuyan, Head- Rural Banking (Agri & FI) and CSR preside the function and exchanged MOU with Mr. Ch Satyanarayan - Zonal head of Heritage Foods Ltd. (HFL), Hyderabad. On this occasion Mr. G.B.Bhuyan, Head- Rural Banking (Agri & FI) and CSR said “We have entered memorandum of understanding with Heritage Foods Ltd. (HFL) to work jointly to provide dairy loans to the farmers. This relationship of Bank of Baroda, one of the premier banks of our country, with Heritage Foods Ltd (HFL) will immensely benefit the farmers in increasing their productivity and earnings under allied activities. Bank of Baroda (“The Bank”) established on July 20, 1908 is an Indian state-owned banking and financial services organization, headquartered in Vadodara (earlier known as Baroda), in Gujarat, India. Bank of Baroda is one of India’s largest banks with a strong domestic presence spanning 5,377 branches and 8,975 ATMs supported by self-service channels. The Bank has a significant international presence with a network of 107 branches/ offices subsidiaries, spanning 24 countries. The Bank has wholly owned subsidiaries including BOBCARDS and BOB Capital Markets. Bank of Baroda also has joint ventures for life insurance with IndiaFirst Life Insurance and for asset management with Baroda Pioneer Asset Management. The Bank owns 98.57% in Nainital Bank. 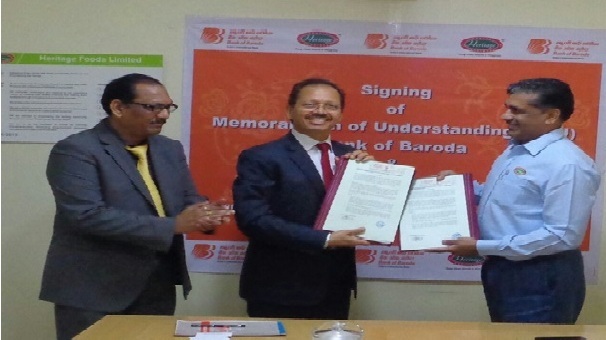 The Bank has also sponsored three Regional Rural Banks namely Baroda Uttar Pradesh Gramin Bank, Baroda Rajasthan Gramin Bank and Baroda Gujarat Gramin Bank.